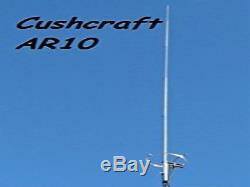 You are purchasing (1) New Cushcraft AR-10 - 26-29.7 MHz 10 /11. Meter Vertical Base Antenna, 3 dBi, 1kW, 17.6 ft. These are the original W1BX FM Ringos. If you want a combination of compact size, wide bandwidth, a low radiation angle, these economical antennas are just for you. Since radials are not needed, you can even use our Ringos indoors. Our Ringos are ½ wave and include built-in lightning protection. Put up one of these easily installed antennas and start enjoying FM! Frequency, MHz : 28-29.7 MHz. SWR 1.2:1 Typical: 1.5 MHz. 2:1 Bandwidth, MHz Gain, dBi: 3.0. Horizontal Radiation Pattern, Deg: 360. Radiator Base Dia, in(cm) : 1 in (2.5 cm). Height, ft(m) 17.6 (5.36 m). Mast Size Range, in 1.0-1.25 inch / 2.54-3.1 cm. Wind Load, square ft (m square) : 1.68 Square feet. Radial Length, in(cm): 13.1 (33.7). Weight, lb(kg) : 4 lb (1.8 kg). All other distributors are offering under 90 days to 1 year. The item "CUSHCRAFT AR-10 26- 29.7 MHz 10 /11Meter, FM/SSB CW Vertical Ringo USA DLR" is in sale since Tuesday, December 4, 2018. This item is in the category "Consumer Electronics\Radio Communication\Antennas\Ham, Amateur Radio Antennas".antennastore" and is located in Lockport, New York.